We admit that home brewing is not a topic that you would typically expect to see at All Garage Floors. 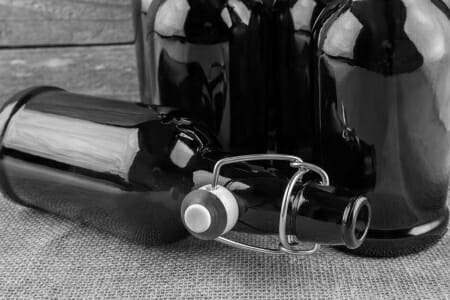 However, with the huge popularity of this hobby, many have graduated from the beginner brew kits used in the kitchen and are setting up shop in the garage or basement instead. Along with this move, the question of proper flooring for the home brewer soon comes into question. Of the various flooring options available, nothing beats the durability, health safety, and easy cleanup of an epoxy floor coating when it comes to home brewing. Appropriate floor sanitation is extremely important and many of the other flooring options available will not provide the proper environment for that. Why not bare concrete for brewing? It’s not uncommon for the first time home brewer to neglect the importance of proper flooring. There is more to think about when setting up your home operation. Besides, concrete is tough – right? Well, if you are setting up your hobby in the garage or basement then chances are that you will be working with burners, kettles, wort chillers, a bottling station, and maybe even a small fermentation tank. When working with equipment like this, it’s not a question of if you will spill liquids onto the floor, but when and what you will spill. Beer is essentially a weak acid. It will actually cause the surface of concrete to deteriorate and break down over time by reacting with the free lime within it. This reaction will slowly dissolve and weaken the surface, causing it to pit and spall. Since most garage floors and basements don’t have drains, whatever you spill tends to sit on the surface. This allows the concrete to soak until you get a chance to clean it up. Bacteria are another problem. Since concrete is porous, the many ingredients that make up beer can grow within the concrete as it feeds off the sugars that penetrate the surface, particularly from wort. These bacteria can create an unpleasant odor that is hard to remove since they become embedded within the surface. Many times the only solution when this happens is to grind or remove the upper layers of the concrete with scarifying equipment. Penetrating sealers and concrete densifiers can be a cheap alternative, but are not recommended for long term use. 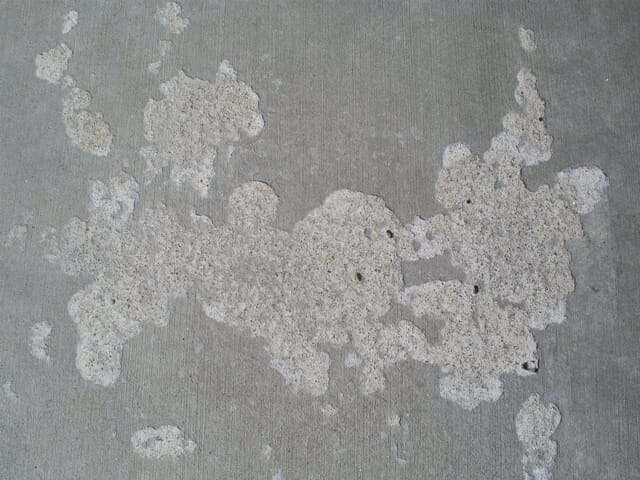 The reason is that not all sealers prevent microbial growth and they do not protect the concrete from thermal shock. Though they do a good job of repelling liquids at the surface, staining of the concrete can still occur depending on what was spilled and how quickly it is cleaned up. Porcelain or ceramic tile is extremely durable, but you can develop problems with the grout. Hot liquids and acidic compounds can cause the grout to break down allowing bacteria to develop. Epoxy grout is a much better solution, but it can be expensive and is harder to work with. Tile can also be very slippery when wet. The benefits of epoxy floor coatings are numerous. Besides protecting the concrete from the many automotive uses of a garage, it makes for an excellent brewery floor as well. The reason for this is that epoxy is a topical, film forming sealer. Once applied, if creates a hard thick coating that is impenetrable to liquids after it has cured. In fact, epoxy floor systems are the number one choice of most large breweries. Epoxy will not allow bacterium to form since liquids cannot penetrate the surface and it’s also very resistant to acids and chemicals. The sticky residue from wort is easy to clean up and staining from brew ingredients is rarely an issue. Generally a mop and a mild cleaner is all that is needed. Depending on the thickness of the epoxy system that is applied, it can be resistant to thermal shock since it acts as a thermal barrier. Hot liquids or steam that can cause the surface of bare concrete to crack, scale, or pop off is protected by the coating. 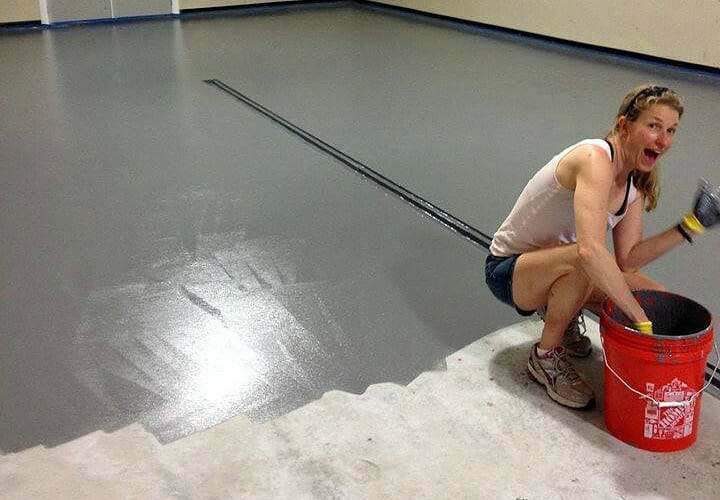 Though epoxy can be slippery when wet, if it is applied in conjunction with an anti-slip additive in the final coat, it can actually provide a fairly good non-slip surface. 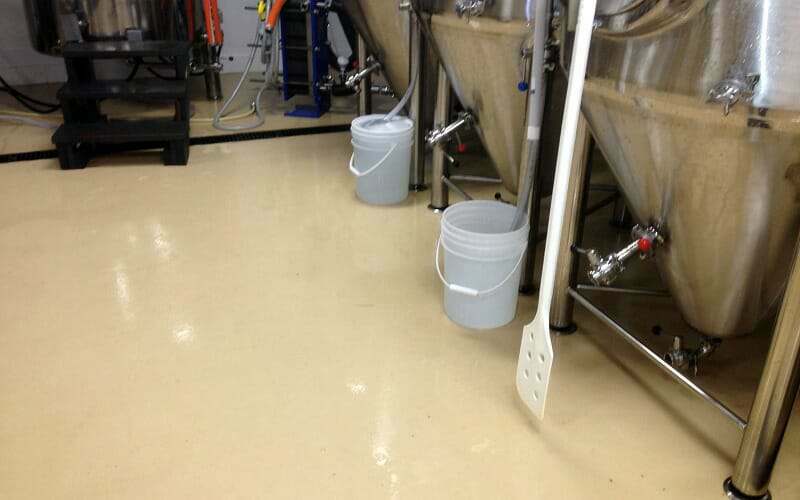 Brew Floors would be our first recommendation for an epoxy floor coating system for a garage or basement home brewery. They have been in business since 1998, providing epoxy flooring solutions for everyone from the home brewer to large commercial breweries. They have developed their own epoxy formulation that is suitable for the brewery environment. What makes Brew Floors unique is the fact that they have carved out a niche for epoxy flooring within the brewery industry. They are familiar with all the issues that a brewer may face when it comes to floor coatings. In essence, they speak the brewer’s language. We contacted Ryan Blum, the president of Brew Floors, and had a chance to ask him some questions. He said that after spending 10 years in the epoxy flooring industry they saw many requests from brewers who wanted to install epoxy flooring systems themselves. That’s when they decided to create Brew Floors. This allowed them to cater their expertise almost exclusively to the brewing market in order to provide commercial quality, DIY epoxy flooring systems that are complete with support along the way. Ryan said brewers tend to be very “hands on” type of people and take the initiative throughout the entire brewing process from start to finish. By providing a variety of select epoxy flooring options and good customer service, Brew Floors gives brewers the confidence and ability to install these flooring systems themselves. As an example, Brew Floors’ standard system is a single coat, 93% high solids commercial epoxy. This is not a cheap, low solids product that you typically find at your local home improvement center. They have a few different systems available that are designed for the brewer based on budget as well as use, ranging from the home brewer to high traffic commercial operations. Some of these systems consist of an epoxy primer, 100% solids epoxy, and an aliphatic polyurethane top coat. Though they are designed with brewing in mind first, they are also an excellent choice to work side by side as a garage floor or basement coating as well. All of their flooring systems come complete with the necessary installation accessories, including a non-slip additive, and complete instructions. If the concrete of your garage floor or basement needs some repairs first, Brew Floors does offer instruction and product for crack repair as well. If your project needs more than just crack repairs, we suggest giving them a call to discuss your options. You can view their product line including pricing here. Be sure to give them a call if you have any questions. Brew Floors prides themselves in helping the average DIY brewing enthusiast and they want to make sure that you understand the application process and the different options available. 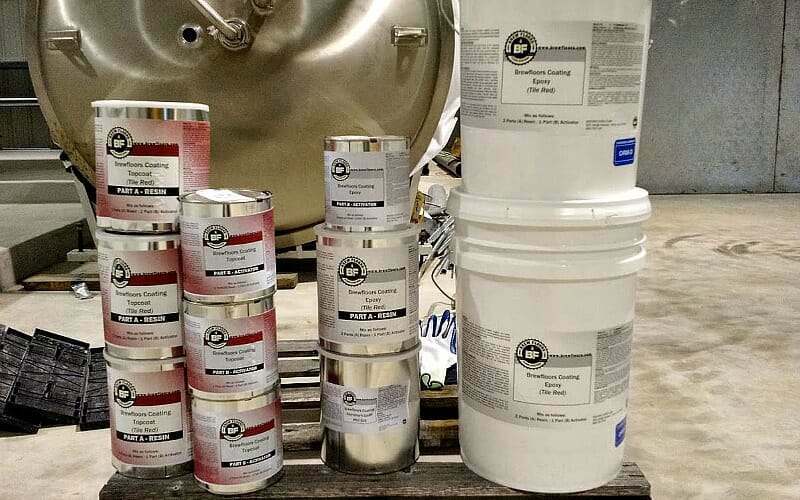 Though there are many quality vendors available who sell epoxy systems, most are not going to be familiar with the type of chemicals and food ingredients that brewers work with. Brew Floors knows your hobby/business and can recommend the best system and instruction to suit your needs.